Canadian hybrid carrier WestJet has settled into another ambitious year during 2015 as it adds more service to Europe and introduces Boeing 767 widebodies into its fleet. That expansion accompanies further growth of its regional subsidiary Encore, which is growing in Canada’s eastern provinces. But depreciation of the CAD against the USD and some economic pressure in Canada’s western provinces where WestJet has a large presence are posing challenges for the airline in 2015. At the same time WestJet is facing oversupply in the Caribbean and Mexico, which is creating pricing pressure in those regions. With its underlying financial strength, WestJet should be able to withstand most of the challenges its faces in 2015 as the company continues to evolve from a traditional low-cost airline to a global competitor. 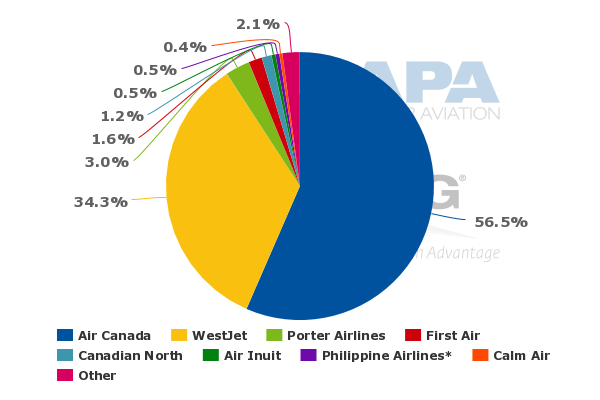 This CAPA analysis of WestJet’s strengths, weaknesses, opportunities and threats continues a series of SWOT reports on global airlines. WestJet joined fellow hybrid airline Alaska in obtaining investment grade status in 2014, a key achievement in obtaining favourable interest rates as its expansion continues. Although its year-on-year profit growth slowed to 5.7% in 2014 from a jump of nearly 65% in 2011, WestJet delivered a return on invested capital of 14.3%, well above its stated 12% target. The airline also has considerable balance sheet strength, reflected by its 34% of trailing cash to 12M revenue for the year ending 31-Dec-2014. WestJet’s adjusted net debt to adjusted EBITAR ratio for that time period was 1.36x. WestJet and Air Canada have established a rational duopoly in the Canadian market during the last few years. 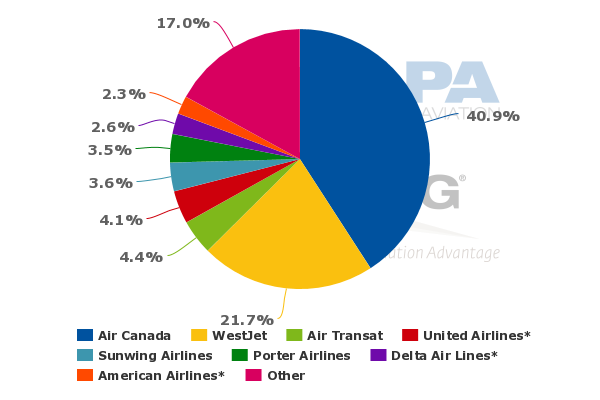 WestJet currently accounts for nearly 22% of Canada’s system-wide seats and 15% of total ASMs. 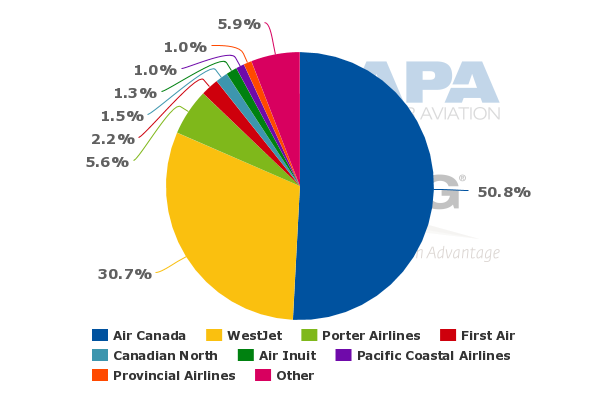 In the domestic market WestJet accounts for 31% of seats and 34% of ASM, according to CAPA and OAG data. Although there have been rumblings for more than a year about ULCC upstarts in the Canadian market, Jet Naked and Jetlines have not yet launched operations. Canadian news outlet the Globe and Mail recently reported that Jetlines is aiming for a Sep-2015 launch, but that is far from a certainty. The hype surrounding those airlines seems to have subsided for the time being, allowing WestJet and Air Canada to retain their respective leading positions in the marketplace. With a great deal of uncertainty surrounding the launch of new Canadian upstarts, WestJet at 19 years old still maintains a fresher and younger image than its rival Air Canada. WestJet is much more involved in social media, with a strategy that entails more direct engagement and wildly successful “feel good” initiatives including the 2013 holiday video that garnered much positive buzz for the airline. The company also uses social media to address challenges, including a recent phone scam in Mar-2015, engaging passengers on Twitter and alerting them to the potential fraud. 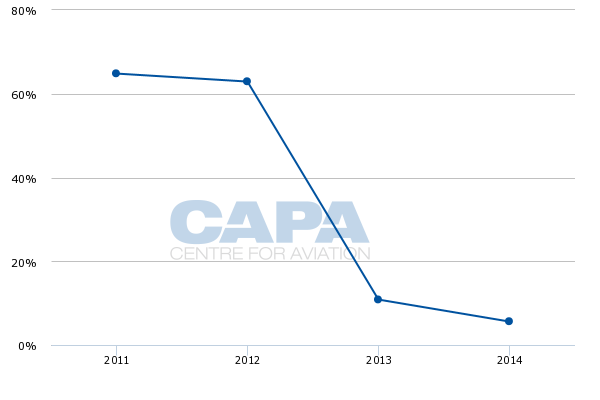 Between 2010 and 2014 WestJet’s unit cost excluding fuel increased from CAD8.80 cents to CAD9.15 cents. A large portion of the increase can be attributed to the establishment of Encore, which was necessary to increase WestJet’s revenue footprint over the long term. But WestJet’s rival Air Canada has pledged a 15% reduction in unit costs from 2012 levels over the medium term, and its unit costs excluding fuel fell from CAD12.7 cents in 2010 to CAD11.3 cents in 2014. Although Air Canada is admittedly opting for lower yields as a reflection of its increased focus on leisure passengers and long-haul flying, its costs for now are still falling faster than its yields. WestJet’s unit costs excluding fuel and profit share notched up just 1% year-on-year in 2014, but it is forecasting 2.5% to 3.5% growth in 2015, driven in part by currency depreciation. 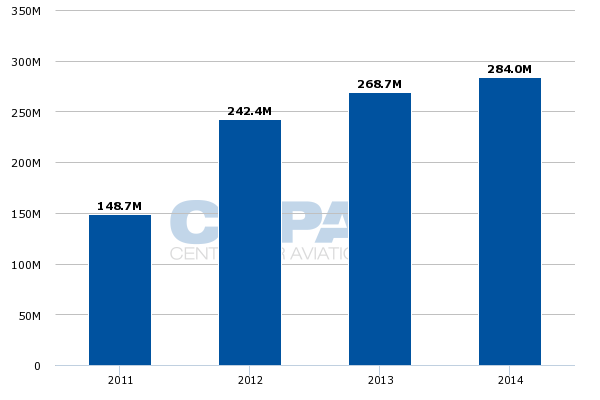 WestJet recorded a 2% increase in yields in 2014 and a 1.7% rise in unit revenues. The airline does not provide unit revenue guidance, but there are two headwinds it faces in 2015 that could pressure yield and unit revenue growth – uncertain economic prospects in Canada’s western provinces and increased capacity on sun routes to the Caribbean and Mexico. Three of WestJet’s top five bases measured by seats – Calgary, Vancouver and Edmonton – are located in western Canada. Calgary and Edmonton are in the Alberta province, which has a large dependency on the energy industry. In a recent report, Toronto-Dominion bank projected that Alberta’s economy will come to a standstill in 2015. But beginning in 2016 there should be some improved momentum in the provinces whose economies are more dependent on the energy sector. Yet it seems in the short term WestJet will feel at least some pressure from the economic environment in portions of western Canada. At the beginning of 2015 WestJet also cited pressure from increased industry capacity from Canada to Mexico and the Caribbean. As a result, WestJet was seeing some pricing and margin pressure on those routes, which does not bode well for a strong unit revenue performance in 1Q2015. During the last few years WestJet has made many network and product changes to position itself more favourably among higher yielding business travellers. This culminated with fare families, which debuted in 2014 with varying levels allow travellers to tailor their experience, including the selection of premium economy section of the cabin on its Boeing 737s. But leisure travellers still comprise a larger portion of WestJet’s passenger mix, and the airline is limited in the amount of business travellers it can capture absent a dedicated business class cabin. As it weighs its product options for recently ordered widebodies, WestJet may need to consider how competitive it aims to be in enlarging its business passenger base, and if a similar product to JetBlue’s Mint could be beneficial over the long term. WestJet initially plans to operate its 767s widebodies from Calgary to Honolulu and Maui and from Edmonton to Maui in Dec-2015. But the initial fleet of four aircraft are being deployed to other destinations in the summer of 2016, which may include existing trans-Atlantic markets. In 2014 WestJet debuted one-stop flights from Toronto to Dublin via St John’s using its 737 fleet and in 2015 it plans to add service from Halifax to Glasgow. With widebody capabilities now in its grasp, WestJet can add service to Asia or Europe, pressuring Air Canada in an area where Air Canada remains in a dominant position. WestJet’s market entry should lower fares in the markets it selects, and provide much needed competition on intercontinental routes. 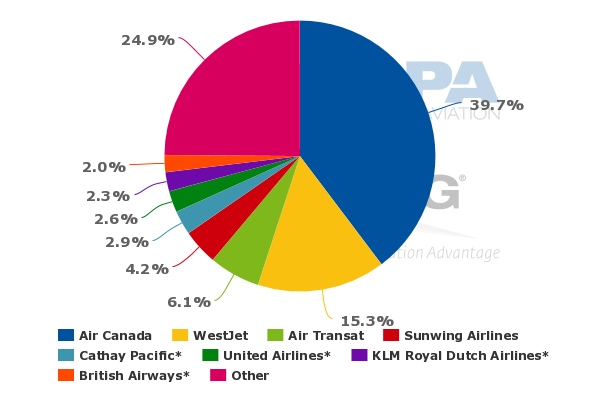 WestJet also has 13 codesharing partners spanning Europe and Asia, giving it a broader network to market to its new international customers. WestJet’s establishment of Encore, which operates Bombardier Q400 turboprops into markets too thin for 737s, should be a key lever for the airline to develop passenger feed on its new intercontinental routes. Previously, WestJet has estimated that roughly 50% of Encore’s customers connect onto mainline fights, which should be beneficial as WestJet expands its reach with new intercontinental flights. By Oct-2015, Encore will operate from roughly 31 stations including several markets in eastern Canada. 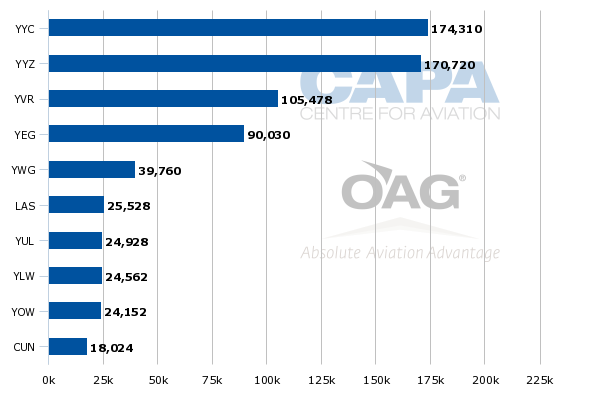 Its fleet of Q400s is projected to grow from 15 aircraft at the end of 2014 to 25 aircraft at the end of 2015 and to 30 aircraft by the end of 2016. WestJet’s decision in late 2014 to start charging for a first bag as part of the new fare bundles, may have ignited some passenger angst. But the decision is part of a broader scheme to increase higher margin ancillary revenues. Its ancillary revenue per passenger jumped from CAD6.03 per passenger in 2010 to CAD11.05 in 2014, and the airline has stated it aims to generate CAD14-15 per passenger in the 2016 to 2018 timeframe. Product unbundling and rebundling through fare families has become a mainstay in the airline industry as airlines grow more sophisticated in their merchandising efforts, and WestJet cannot leave those higher margin revenues untapped. As WestJet moves into new frontiers that position the airline squarely in the hybrid space, it must ensure that it sustains loyalty among the passenger base that propelled the airline into a position of strength – cost conscious leisure passengers. Even as the new product bundles create a significant revenue opportunity for the airline, passengers may feel a bit put off by the new structure, concluding that certain aspects of the travel experience have been stripped away and are now part of a slew of new charges. WestJet faces the delicate challenge of rewiring passenger expectations as it evolves it ancillary revenue strategy further, perhaps into dynamic pricing. The amount of change undertaken by WestJet during the last two to three years has been significant, with the creation of a new regional subsidiary and its ambitions to launch widebody flights. Some employee discontent has accompanied those changes. WestJet’s flight attendants rejected a tentative agreement in late 2014, while its pilots approved a deal in late 2014 after rejecting a previous agreement in 2013. As it continues to grow, it will take even more effort for WestJet to preserve one of its largest advantages – a favourable culture. Although WestJet is intimately familiar with is major rival Air Canada, Canada’s full service airline during the last few years has cleaned up its balance sheet, lowered costs, started to meet it own return targets and has sustained its liquidity above its minimum threshold. Arguably, a healthier Air Canada is a plus for Canada’s aviation industry. But the flag carrier's new found stability will no doubt push WestJet even harder to maintain its cost advantage and sustain is loyal passenger base. WestJet has done a commendable job of transforming itself from a traditional low-cost carrier to a hybrid looking to evolve into a long-haul, widebody operator. Most of the transformation seems to have been executed seamlessly, which is no small feat given the flux of change the airline continues to undergo. Most of the challenges facing WestJet seem to be short term in nature, and are certainly obstacles the airline has faced many times in the past – pockets of economic weakness and oversupply. WestJet can no doubt weather those challenges as it works toward its long term goals. The biggest uncertainty for WestJet is if it can attain its desired results in long-haul operations. If the past is any indication, the airline is well positioned to achieve its goals.